7 Yummy Yellow Pieces To Celebrate *Fry-Day* The 13th! Happy Fries Day, peeps. This day is probably the happiest day of the summer, dedicated to celebrating the king of all junk food… french fries. Fun french fry fact - it is NOT French. It was a Belgian invention thanks to frozen rivers and hence, no fried fish. Americans when introduced to the delicious fried potato dish by the French-speaking Belgian soldiers, started calling it the french fry. Aren’t we grateful for the genius Belgian people! If it weren’t for them, we’d be living a less happy life. No matter what you’re going through, fries help you let it out and then get over it. And of course, when you’re happy, they make you happier. So, obviously, these long sliced fried potato sticks are more than food. It’s a global endorphin-releaser. Not only do french fries taste good, they LOOK so good. That bright happy yellow is a sight to behold. All in all, they’re a great addition to everyone’s lives. The proof is in the popular quote ‘fries before guys’. Time to celebrate, don’t you think? Of course, the plan is to chow down our bodies’ weight in fries. But for us fashion girls, you know, we express our happiness through clothes. Duh. 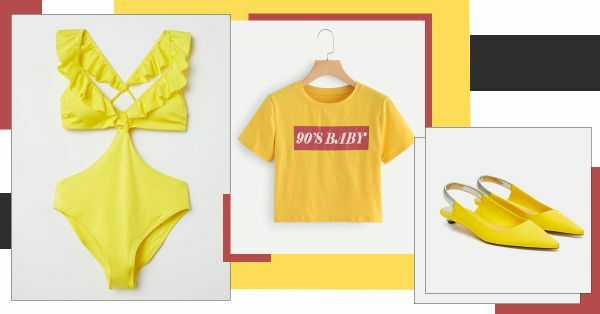 So here are 7 sunshine yellow or, as we like to call them, *french fry yellow* fashion pieces that will remind you of your favourite junk food all day. Yay! Feeling hot-hot-hot? 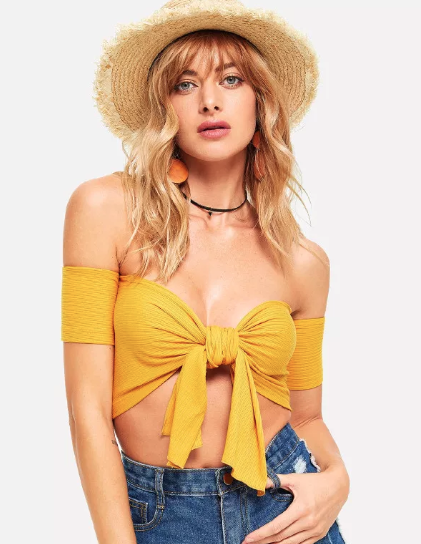 Slip into this yellow knot detail off-shoulder cropped top. Looks good enough to eat, eh? Style the top with some high-waisted wide-legged linen pants and boho flat sandals for a sweat-proof look. Send away the summer blues and add a spring to your step! How? 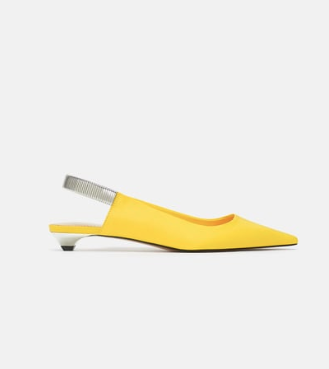 These cool slingback shoes are the coolest shade of yellow. Wear them with the classic white-tee and blue-jeans outfit to brighten it up. Don’t you just love summer romances? We’re currently involved with this very flirtatious ruffle strap cutout detail swimsuit in the yummiest yellow. P.S. Pool pictures are better in a cute yellow monokini. Trust us. Didn’t this vibrant french-fry yellow just light up your mood? It did ours. 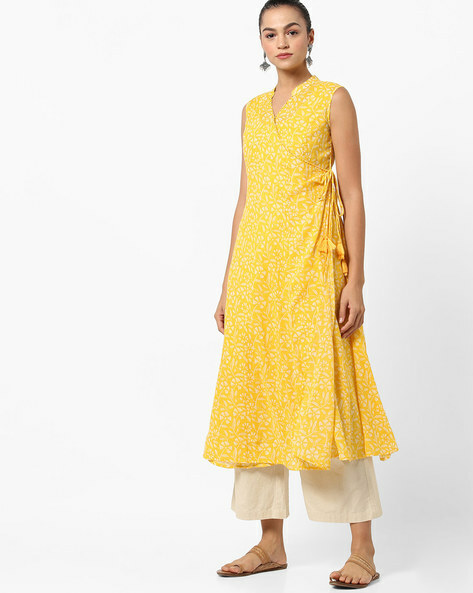 This angrakha style has been on our wishlist for ages. Step out for a casual lunch in this floral print kurta and white culottes, Sonam Kapoor style. Perfect! 90s nostalgia has a special space in our closets. 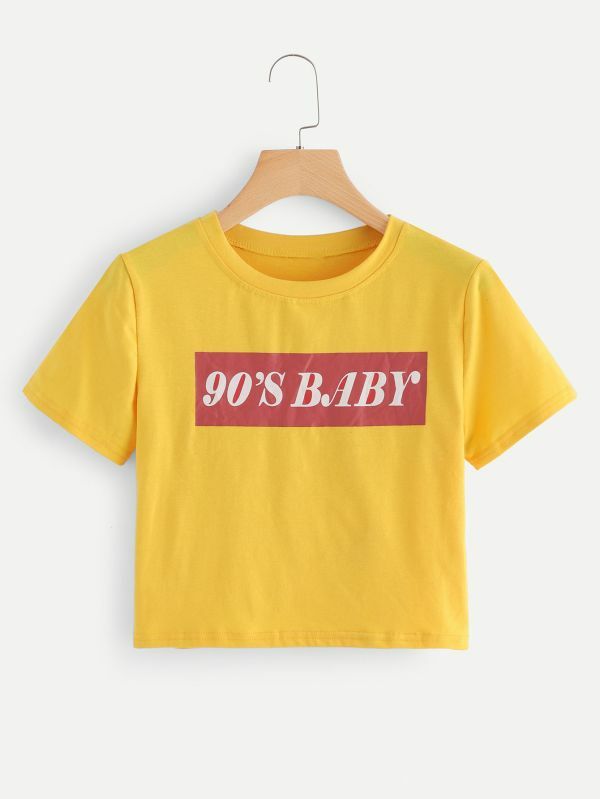 This t-shirt reminds us of the good old days when we went out to McDonalds’ to drown our sorrows in a large portion of yellow fries smothered in bright red ketchup. BRB, adding to cart. 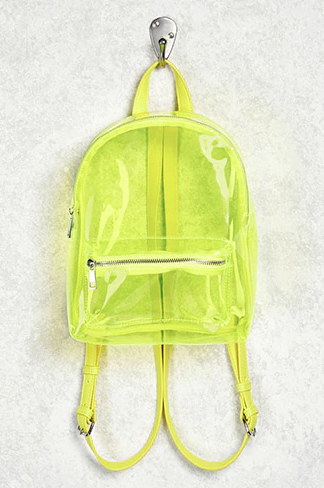 A yellow backpack is cooler than a regular backpack, capisce? Add this accessory to mix up your go-to basics. Looking for bright but chic dresses to beat the heat in? Your wish is our command. This yellow dress with bow detail is the perfect outfit for a day date. Wear it with black flats and matching crossbody bag.